Now in his second year of medical school, Liam Barrett tells us how his IB career led to medical studies and spending a summer in Ghana applying his medical skills. Liam is a graduate of CTC Kingshurst Academy in Birmingham, UK. 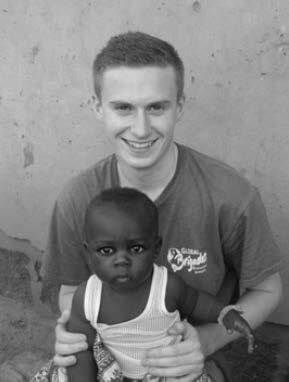 Liam Barrett with a child at the medical clinic in Ghana which he helped to set up. Q: What skills did you learn as an IB student that help you in your medical studies? I valued studying the necessary DP sciences to apply for medicine, but history and English were also important in teaching me how to analyse, evaluate, conclude and articulate my opinions, developing a well-established academic writing style. Completing a biology-based extended essay allowed me to critically analyse literature and evaluate its validity, a skill that is now vital when reviewing a vast amount of medical journals. Being able to cipher through sources efficiently is of great importance. The IB requires good time management to balance the workloads and this gave me a solid grounding for dealing with the strict deadlines at university. Keeping composed under pressure is something that the IB develops well in students. Q: Tell us about your trip to Ghana. Describe how you got involved. I heard about Global Brigades, a student-led global health and sustainable development organization, through my university. They offered a fantastic opportunity to experience international medicine and get involved in making a significant difference to the lives of people in Ghana. I helped to set up and run a clinic and pharmacy, providing self-sourced medications to thousands of local people. I performed clinical skills such as taking blood pressures at the triage section, observing doctors and dentists and helping form diagnoses. I also travelled to local homes to educate the communities about health problems such as malaria, diet, sanitation and water hygiene. Q: What challenges did you face during your trip? The medical cases that we saw were eye opening, including malnutrition, bacterial infections, severe malaria and infected gangrenous leg ulcers. It made me appreciate the UK’s health care system as I experienced first-hand the vulnerability of these communities with a lack of access to medical care. It was alarming to see the terribly thin children, but what really struck me was their defiant spirit. It was a privilege to be able to speak to, treat and educate the people of Ghana. The experience I gained will stand me in good stead for my future career in medicine. Once I graduate in 2017 I am aiming for a competitive foundation year placement in London with the ambition to specialise in Emergency Medicine. I also hope to continue to assist in medical work on a local and international level with Global Brigades and I have recently been elected as the President for the Global Medical Brigade to Honduras that takes place next summer, leading a group from the University of Birmingham. Here is a link to a video that I made showing my work in Ghana this summer. I hope you enjoy watching it.